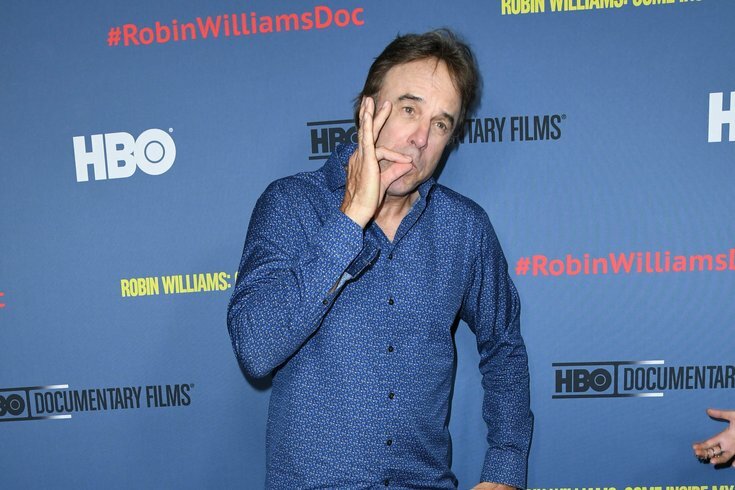 Kevin Nealon arrives at the premiere of HBO's documentary film, "Robin Williams: Come Inside My Mind" at Los Angeles' TCL Chinese Theatre on June 27, 2018. Kevin Nealon has had roles in dozens of movies. He’s been a regular on several TV shows, including an uncommonly long stint on "Saturday Night Live." He’s a respected member of the comedy fraternity, who’s a mainstay on nearly every major late-night talk show. He’s even an accomplished drawer, sharing doodles he’s done of his friends, co-stars and people he meets on the road, to his 1.4 million Twitter followers. But Nealon got his start in stand-up comedy, a discipline he took up around nearly 40 years ago and never really stopped doing. He’ll be bringing his stand-up stylings to Philly this week, with a run of five shows at Helium Comedy Club between Thursday and Saturday. Ahead of those shows, Nealon spoke with PhillyVoice about his long stand-up career, his run on SNL, the state of comedy today, and which of his old characters most reminds him of President Donald Trump. “I never stopped doing stand-up, even during SNL and 'Weeds,'” Nealon said. But even during his time on SNL, his run on "Weeds," <="" class="sh_keyword" his="" live"="" night="" on="" run="" saturday="" sitcom="" span="" stint,="" style="margin: <p>But even during his " the="">and various movie roles, Nealon kept going on stage, with a couple of Netflix hours under his belt in recent years. What can we expect from the shows this week? “I have a lot of areas I’m working on, so I’m excited about that,” Nealon said. Nealon added that he’s working on material for an upcoming special. Among comedy fans of a certain age, Nealon is strongly associated with his time on "Saturday Night Live." His run on the show, from 1986 to 1995, was one of the longest in the history of the series, a tenure that included a stint on the "Weekend Update" desk. Nealon came from the era of “Mr.” characters – he played recurring characters named Mr. Subliminal and Mr. No Depth Perception – and his time on the show overlapped with two distinct eras. He started on SNL along with the Dana Carvey/Mike Myers/Phil Hartman/Jan Hooks group, and stuck around through the heyday of Adam Sandler and Chris Farley. The latter connection has proved fruitful to Nealon’s career; he’s had bit parts in many of Sandler’s movies. “The SNL stuff has always been about ‘what was it like working on there? Was it hard?” Nealon said of his SNL experience. His answer? “It’s as difficult as you make any job. He’s especially fond of his memories of Hans and Franz, the Austrian musclehead duo played by Nealon and Carvey in padded sweatshirts. Nealon’s SNL stint was also when he honed his drawing habit, which he’s since taken to his personal website and now to Twitter. "When I travel, I like to draw and sketch and doodle. But I've been drawing since I was in high school. I spent a little more time on it lately," he said. "Even during SNL table reads, [I would draw] Chris Farley, Adam Sandler, Al Franken or Conan O'Brien." Nealon also enjoys sharing sketches he made during his travels. Once he finishes his upcoming stand-up sets, Nealon said he'll return to Los Angeles to film a new season of "Man With a Plan," the sitcom in which he co-stars with "Friends" star Matt LeBlanc. As for comedy today, Nealon is bullish. "I think the state of comedy is healthy, and I think people are enjoying it," he said. "There was a window of time in the late '90s and 2000s where no one was coming to comedy clubs." But now, he said, The Comedy Store in Los Angeles is selling out regularly. He named-checked Bill Burr, Anthony Jeselnik, Whitney Cummings, Brian Regan and Jim Gaffigan as among his favorite working comics today. "I think people need comedy now more than ever," he said. Nealon plays Helium Comedy Club tonight at 8 p.m. and then at 7:30 p.m. and 10 p.m. on both Friday and Saturday nights. It’s part of a big month for the comedy club on Sansom Street. Philly native Blake Wexler performs there Wednesday night, with John Crist playing sold-out shows on Aug. 13 and 14, and Josh Blue performing from Aug. 16 through 18. Dan Soder, the comic who also plays a supporting role on the Showtime show “Billions,” is scheduled for Aug. 23 and 24.